Around 1200 b.C., at the end of the Bronze Age, ended also a civilization begun perhaps onethousand years before, or still more ancient, contemporary of the great civilizations of the Middle East. At the beginning a native product: the Minoan period, and continued then, with the coming of Indo-Europeans populations, with the Micenaean one. For centuries historians and poets have conjectured and argued regarding the men and the events of that time (the War of Troy also, happened perhaps centuries before, was involved in the "legend"). Sure the imposing ruins of walls and cities were a reason for inspiration already in classical ages, indeed it can be said that, only three centuries after these destructions (when probably the Iliad and the Odissey were composed), the real sequence of events had been lost and those same ruins had become, in the opinion of the Hellenes, fruit of fights between Gods or jealousies and anger of Heroes. And it is on this "discrepancy" between the poetic reality (which is also always a truth, even if hidden) and the archaeological, "scientific", truth, that I want to make some considerations. Regarding the history of Greece before the classical ages nothing up to now was known (the same for Italy and all continental Europe), unlike Near East, where already from 3500 b.C., with Egypt, many documentations have been left, both of writing and of true history; the only documents were artefacts (pottery, buildings, statues) and the legends that in historical age were told. For Greece, the only exceptions were the poetical masterpieces the Iliad and the Odissey, with which it effectively seemed modern people could get an idea of what had been the "civilization" before the advent of writing. But, during archaeological excavations at the beginning of this century (particularly in Crete) by A.Evans, many clay tablets were discovered with registrations that, 50 years later, proved to be transcriptions of an archaic form of Greek, even if not directly to connect with any of the classic dialects (ionian,aeolian,etc..). The exact dating of these clay tablets is still uncertain, even if their state (baked by the fire) makes us think they were written contemporarily or a little time before the destruction of the palaces where they had been found. The most sure dating varies between the 1200 and 1100 a.C.
- the descent from the north of the Dorians, a greek tribe similar to the Micenaeans (sure for the language, less sure for race), historically the ancestors of the Spartans. The succession or the frequency of the events remains however unknown. Of these events, only one, the descent of Dorians, persisted in the memory of classical Greece, linked to the legend of the return of the Heraclides, to the Myth of Hercules. No echo instead by Homer of the three facts! Perhaps the adventures and the wanderings of Odysseus reflect this period of piracy that produced and followed the fall of many civilizations, not only the micenaean one, all around the East-Mediterranean Sea, but in the Odysseia they aren't reminders of the great empires in the Middle East and especially of Egypt, with which we know the Micenaeans entertained commercial and political relationships. The question is: why does Homer ignore those 3 historical facts? "..not of stone nor of iron is their flesh to resist the bronze that cleaveth the flesh, when they are smitten." the poet is forced (voluntarily or involuntarily) to a historical nonsense: iron is known as a metal of high quality, but it is not used for the construction of weapons. It seems nearly that his poetry forces him to only one level of action for the events while makes him blind (!!) to some others. After all, during all the narration (of the Iliad), the greatest effort of the poet seems to be a justification of the behavior of both opponents, as depending from the will or the whim of the Gods. To what end would have a Greek "placed on the same footing" the two populations , the "anatolian" and the Greek, so different one from the other? Or perhaps rather this "War against Troy" of Homer would not mask the description of an "inner" conflict and the entire work as a start of a possible reconciliation, nearly a political attempt? But pushing the hypotheses still more ahead: if is not Troy the real city of which Homer speaks, could perhaps be one of the many cities besieged and destroyed from the Dorians? Many of the linguistic characteristics of the Greek language spoken from the micenaean civilization remained at all unknown to the generations that came later, so it can be asserted that the dorian invasion was like a genocide. For a very long time the zones that had been left by the Mycenaeans appear to the archaeological analysis in a condition of impoverishment and abandonment and sure could not the dorian population (then lacedaemonean), that had replaced the micenaean, assume the role that before it the last one had, even if for approximately one hundred years, an artistic production with " micenaean style " was known in the Mediterranean Sea. 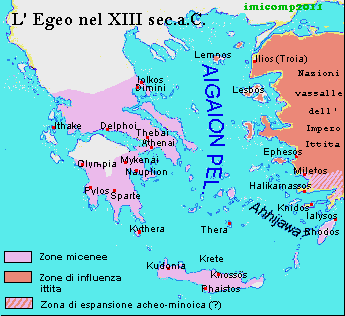 According the opinion of some scholars (Latacz) the consequencies of those catastrophes couldn't have been at all decisive to the future developements in Greece' history (with the exception of dorian invasion in Peloponnese) : the mycenaean ruling class (the aristocracy) and a part of the population, could have found refuge in Athens, in Eubea and in Cyprus, where they could mantain their former style of life, and, last end, putting the basis for the ioniasn Renaissance of VIII century b.C. It is however difficult to think of a coalition of achaeans kingdoms, suffering by the end of the XIII century from various problems and attempting an attack to a city, Troy, stroken by the same events (e.g. the Sea-Peoples). Appearing of a new kind of pottery, the "coarse ware", contemporarly to the Late Helladic IIIC pottery, at the end of XII century, but far from the mediterranean tradition, in Troy, in Greece and in southern Italy could be, some scholars tell, among others J.B.Rutter (see the Link to his work on this Page), a proof for an invasion from the danubian area. Another possible cause for the fall of the micenaean civilization (even if currently rejected by most of the scholars), or better a concomitant cause, given the certainty of the other events, could have been the explosion of social upheavals: a so well organized society, and with such an high level of production, of commercial traffics (micenaean objects are found in all the Mediterranean area and also beyond), of prosperity of the more elevated classes, presupposed an exploitation of the lower classes. Sure is the existence of slaves and also of workers, stablily engaged in many productions. And here perhaps more strongly the homeric picture of a patriarchal society, would be far from the mycenean reality. Perhaps the true punitive expedition (if this one indeed happened) was not of the Greeks against the Anatolians (Troians), but exactly the opposite one: populations longing for vengeance of the abduction of women carried by the Mycenaeans in Anatolia for slavery: a convenient labour force for a state that needed more and more money.